A customer had purchased some power supplies from Amazon UK to get started with the development on their product. And why not? There are lots of cheap products available and everyone has a budget to meet. The chances are that they’ll get damaged, lost or broken anyway. Externally, the only way to tell the difference between the compliant and non-compliant versions is a slight difference in the length of the barrel connector and a slightly different shape of strain relief grommet. These devices are being marketed as the same device on the outside and yet are completely different on the inside! I’ve not been able to subsequently find this exact power supply on Amazon but there are similar looking variants still available. Crucially, it’s not just EMC that is being sacrificed. This “race to the bottom” of extracting every last penny from products has more serious consequences. More dangerously for consumers, electrical safety is also being compromised as shown in this study from Electrical Safety First on Apple chargers. At a previous employer, an inspection was performed on 50 power supplies (again, bought from Amazon) that one of the project teams had purchased for powering various development platforms within the company. This revealed some serious safety problems (creepage and clearance) resulting in the entire batch being quarantined and scrapped for recycling. Another aspect to consider – if the manufacturer has two different, almost indistinguishable products then how does your supply chain guarantee that you will receive the correct one? 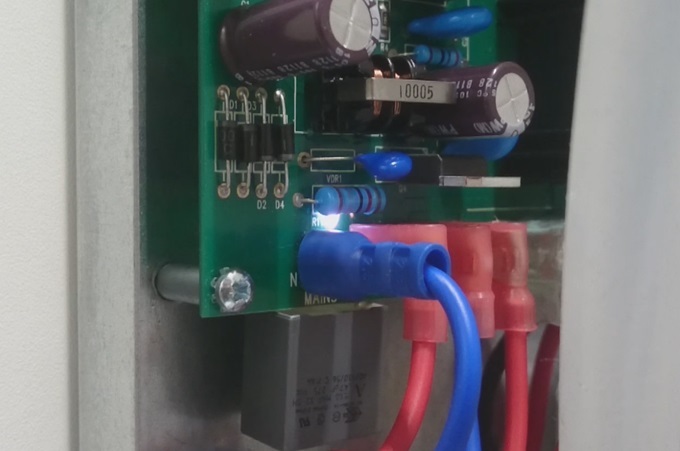 What is to stop the manufacturer from swapping out the more expensive compliant power supply halfway through production? The principle of caveat emptor still applies. Disingenuous product markings are being used to falsely indicate compliance. The obvious way round this is only to buy small quantity power supplies from trusted suppliers. I know from working with other customers that suppliers like RS and Farnell / Element 14 take compliance seriously. Buying from these sources is more expensive financially but what price do you put on your own safety? If you are relying on buying a pre-approved power supply always ask for the EMC and safety test reports and the Declaration of Conformity. A supplier who cannot readily supply these readily should be disregarded. Compare the details in the reports with the physical sample in front of you. Especially for safety reports, photos of the unit are generally included, inside and out. Look for any differences between the two. 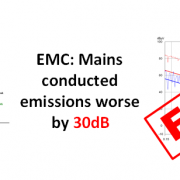 Differences in EMC performance are not obvious. The only way to be sure of the quoted performance is to perform some quick tests, conducted and radiated emissions being the two main ones. Please get in touch to reduce your stress levels. 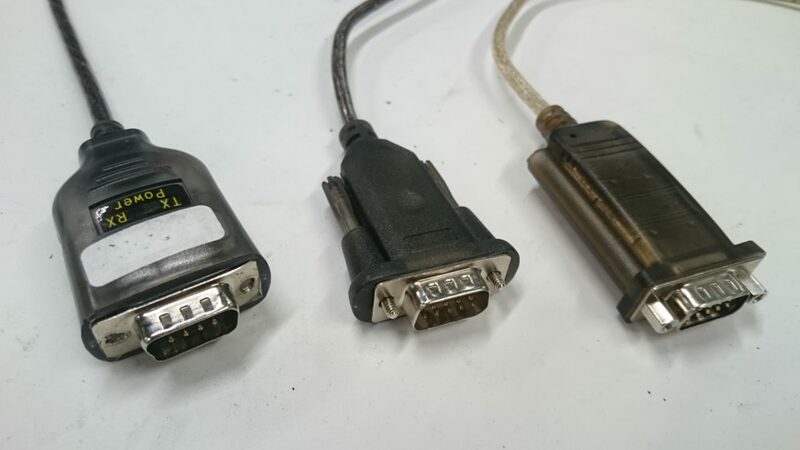 These little converters are super handy to interface between your modern PC or laptop and the simpler, lower technology RS-232 serial port used by many pieces of equipment for control or debug purposes. However, like any commodity item there are design compromises, including EMC ones, that you need to be aware of. 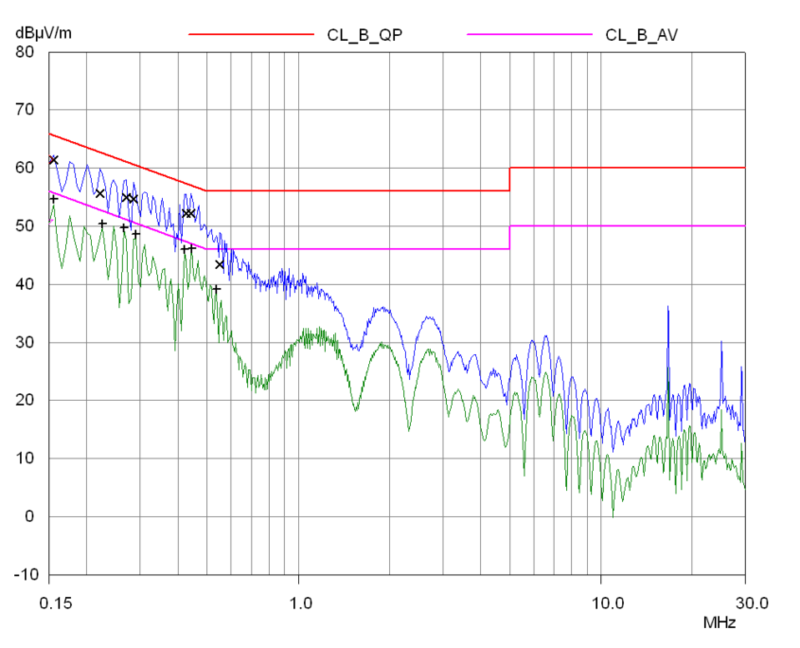 I was recently performing some Electrical Fast Transient (EFT) testing on a customers product and was surprised to observe it failing at quite a low level of injected transient of 200V. It appeared that the whole system crashed when the bursts were applied to any of the digital I/O ports. Even more confusing was that I’d looked over the schematic and the port protection measures that they had implemented were very sensible with ferrite beads and diode clamps. A pointer came from observing the front panel of the device with all of it’s indicator LEDs blinking away as if it was working properly. Yet the equipment under test (EUT) wasn’t responding to serial communications and the TeraTerm serial port software was still showing a connection. Checking through the test setup, I theorised that the RS-232 to USB converter that I was using might be crashing or responding to the EFT pulse as a start bit to a frame. Despite being isolated with a Coupling/Decoupling Network (CDN), when a scope probe was added to the RXD line on the decoupled side of the CDN, a transient with 30V of pk-pk amplitude was visible when the EFT burst was applied. I tried two other converters that I had in the lab and none of them were happy with this pulse and also refused to work correctly. So I knocked up a small filter PCB with a pi filter on each line (RXD, TXD and 0V) consisting of 2 x 100pF capacitors and a ferrite bead. The non-line side of the caps was taken to the HF ground plane using some adhesive copper tape (the EMC scoundrel’s last resort!) to return the currents back to the generator and not into the converter. Success! No more interference and the converter works perfectly. 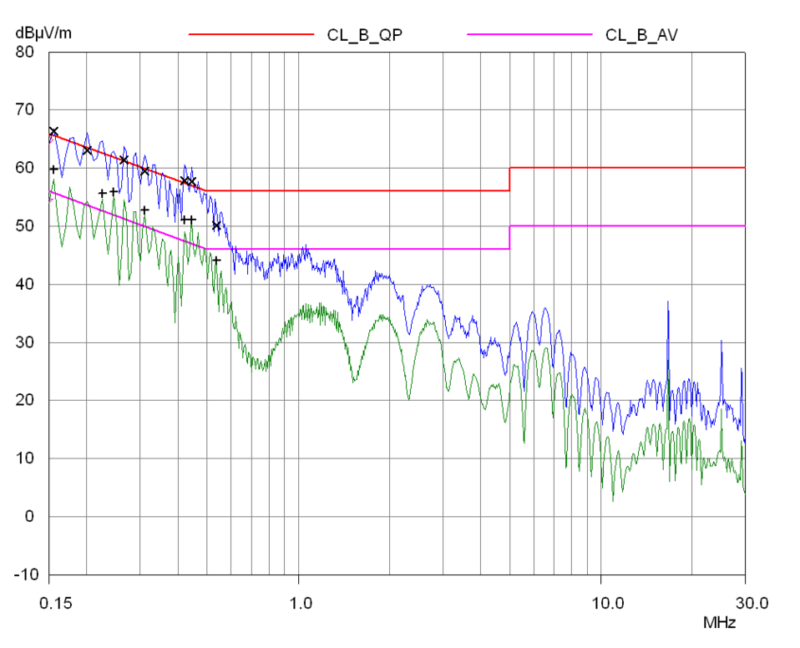 As an experiment (OK, I got slightly distracted by something interesting) I played around optimising the filter and managed to get it down to just two components – a 100pF capacitor on the TXD and RXD lines of the converter. Now I know that these devices will be designed to the lowest price point but two 0402 capacitors is hardly breaking the bank! It does make you wonder how they managed to get through their own EMC testing, if at all. Incidentally when this was later tested in the chamber it had some fairly strong 12MHz harmonics from the USB 1.2 data lines that only just squeaked under the limit line lending further weight to my suspicions of corner cutting and poor design! 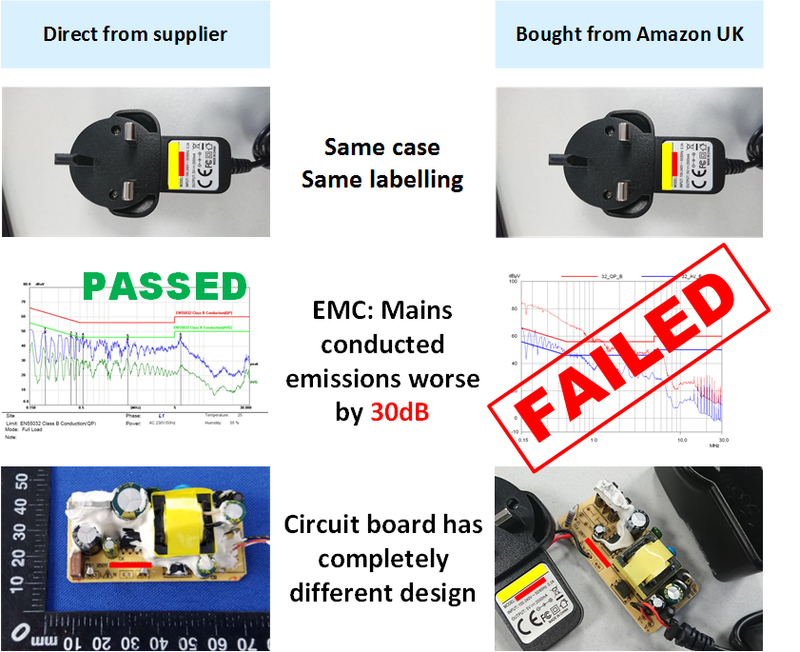 Beware of cheap generic test adaptors and EMC issues caused by them – both immunity and radiated. Consider your port filtering carefully. Many I/O interfaces can stand a small capacitor or filter adding to it and the benefits for EMC are significant. It gives a path for interfering signals to the local ground and will also improve your emissions too. The customer who’s product I was testing had such parts fitted; it passed the testing at 1kV EFT without issue (the spec is 0.5kV). A customer requested some support with one of their products, an IoT bridge device that takes various sensors and provides telemetry back to a central server using a GSM module. Some of the radio pre-compliance spurious emissions testing had suggested there might be some issues at certain frequencies. After a couple of hours of radiated emissions measurements in the anechoic chamber and some bench work with some near field probes, I’d developed a pretty good idea of what was going on in terms of where the emissions were coming from and what their radiating mechanisms were. These features are common to a wide range of similar devices so some notes and a simple drawing (oddly I find sketching like this a good way to relax!) are presented in the hope it will give you some ideas about where your radiated emissions might be coming from. 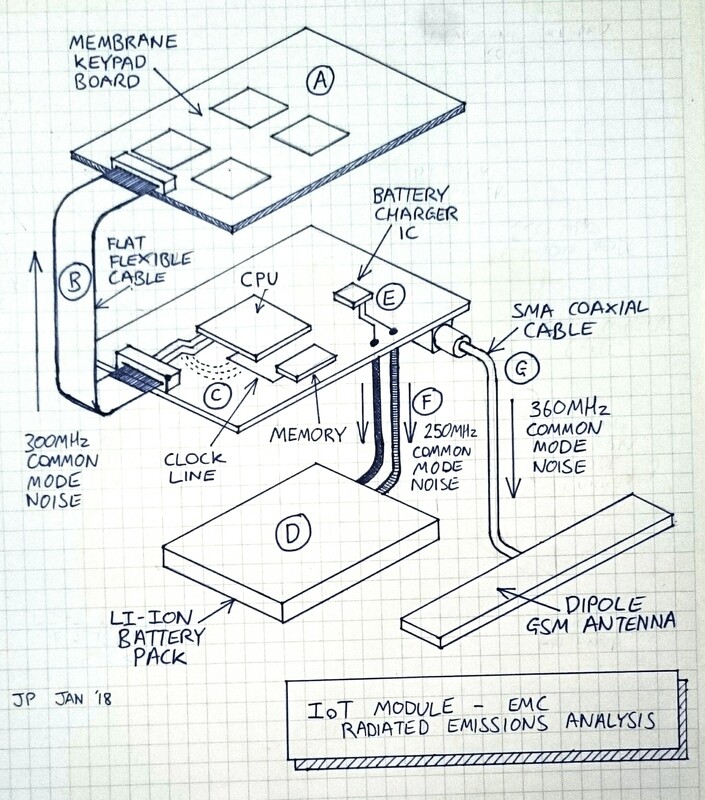 The sketch shows a keypad board, a CPU board and a battery pack. Some other information is missing to permit a simpler drawing. All of these boards below sandwich together nicely into a plastic case which was the starting point for the investigation. The problem frequencies identified were a 300MHz narrowband spike and a 250MHz broadband hump. Usually when I see broadband I think “power supply noise” and narrowband I think “digital noise”. Let’s take a wander around the device. 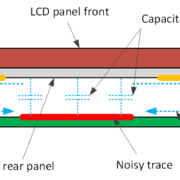 Capacitive plate near field probing around (A) showed higher than background levels of 300MHz noise around the front panel button board. Since this was a “dumb” board, the noise was probably coming from the main CPU board. 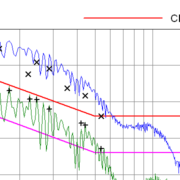 The noise emanating from the cable (B) was not appreciably higher but when approaching the CPU/memory the noise increased, the clock line between the memory device and CPU being the highest. 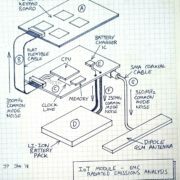 Two possibilities were that there was crosstalk on the PCB at (C) or perhaps inside the CPU itself but without getting into more complex analysis the exact cause is not known. Apart from the power lines, there was no extra HF filtering on the data lines, just a series resistor on the I/O lines of the CPU. 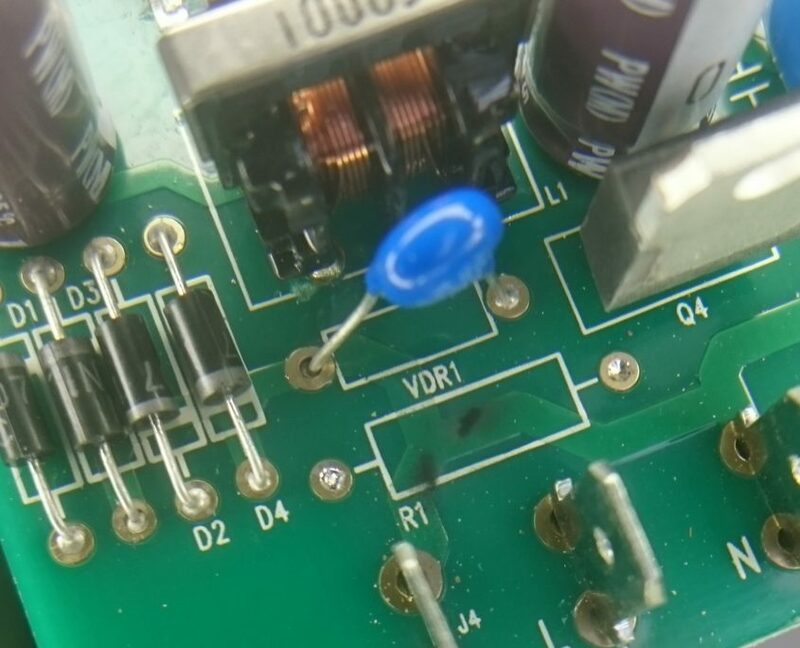 The addition of a small capacitor (e.g. 47pF, either 0402 or an array) on each line to circuit ground forms an RC filter to roll off any unwanted HF emissions like this. I generally advocate making provision for such devices on the PCB but not fitting them unless required – better to provision for and not need than to require a PCB re-spin later in the development cycle. Moving the near field probe around the bottom of the case where the battery lives (D) showed the broad 250MHz hump present on the battery. 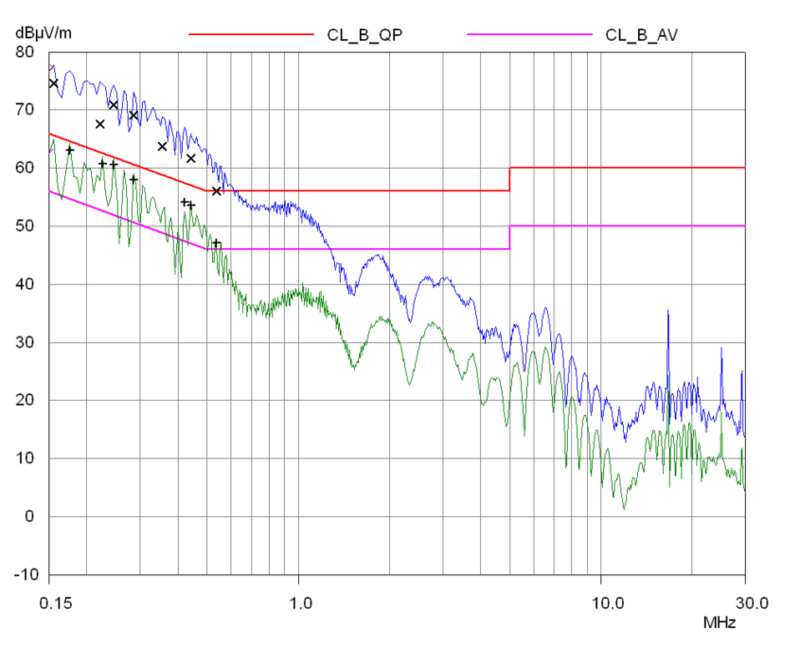 Unplugging the battery pack made the emissions drop by 10dBuV/m and measuring with a high bandwidth passive probe showed broadband noise present on the outputs of the battery charger (E) from the switching converter. Some low-ohm ferrite beads in series with the battery terminals will help keep this noise on board and prevent common mode emissions from the battery and cables (F). Lastly, the antenna was unplugged and some other broadband noise was found on the cable (G) at 360MHz, this time from the main 5V DC/DC converter on the main PCB. So what is the common theme? 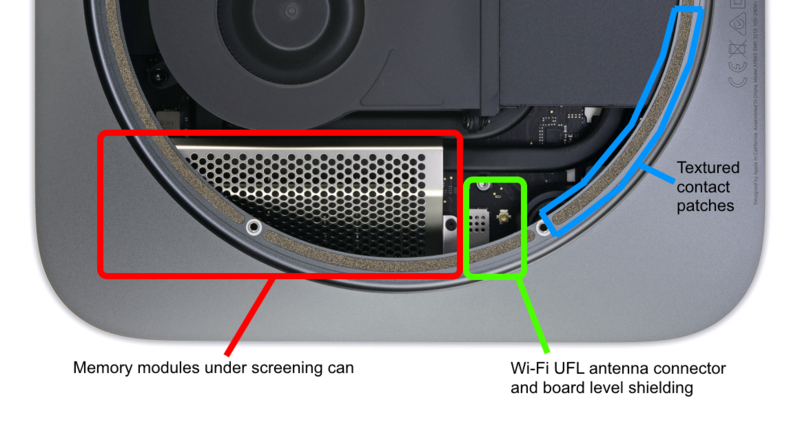 All the radiation problems stem from cables connected to the main PCB. As soon as you add a cable to a system you are creating a conductor with a poorly controlled return path or “antenna” as they are sometimes known in the EMC department! 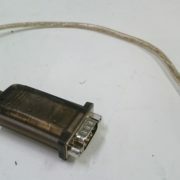 Treat any cable or connector leaving your PCB as an EMC hazard. You have less control over the HF return paths in the cable environment than you do on the PCB. Apply appropriate HF filtering to the lines on the cable and remember that even a shielded cable can cause problems. Sometimes, like the antenna cable, there’s not a lot you can do about it other than practice good design partitioning to keep noisy sources away from the cable and to apply a ferrite core around the cable if it becomes a problem during testing. I hope you found this useful and that it has given you some pointers for looking at your own designs with a new perspective.